When in the history of plays has a young writer taken on a hundred plus years old classic and written a “Part 2”? The audacity of Lucas Hnath’s undertaking is only outweighed by his stellar, modern take in “A Doll’s House, Part 2.” Norwegian Henrik Ibsen must be applauding from Playwright Heaven. When the issue of whether Nora and Torvald are legally divorced comes up, we are challenged again on women’s rights. Is the world still that backwards? Can Nora ever extricate herself from male oppression? Can Torvald act generously, at last? 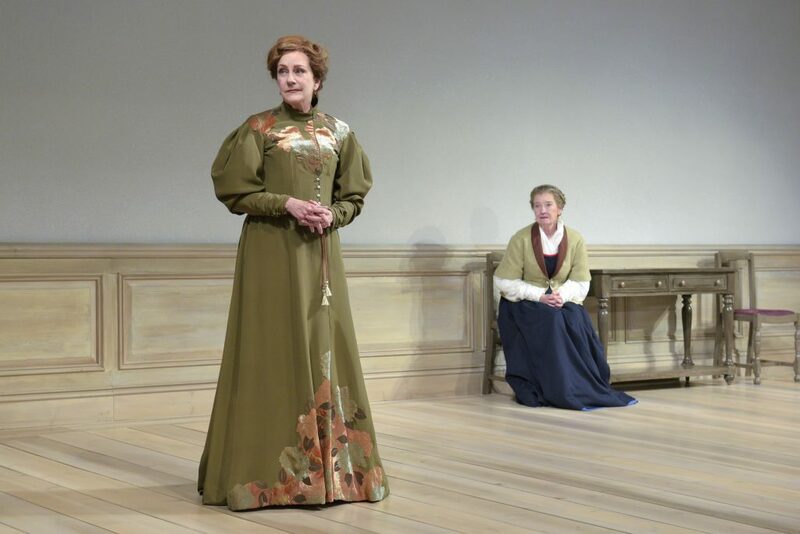 Everything about Hnath’s play opposes the realism of Ibsen’s 1879 “A Doll’s House.” Andrew Boyce’s stark set has four characters rattling around in a immense room—with only one table and two uncomfortable chairs. The beamed ceiling is impossibly high—and there’s one door only—the famous door through which Nora Helmer exited, leaving her husband and children—scandalizing the bourgeois world. 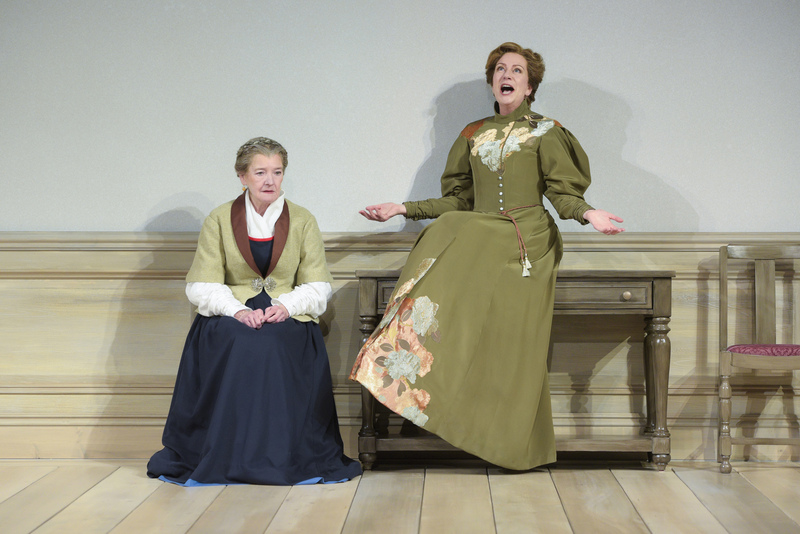 In Hnath’s new play, already the winner of lots of awards in New York last, Nora (spectacular Mary Beth Fisher) returns to this loveless home fifteen years later. She’s no longer the little “doll” who danced for her husband, Helmer (hypnotic John Judd), the banker. Now she’s a ramrod straight, imposing, and articulate feminist writer. The tables are turned, in this 21st Century comedy. New Nora has written books that encourages women to leave their dictatorial husbands. She’s a ground-breaker, fabulously dressed in Annie Smart’s lavish flowered gown. Les Waters direction is crisp and witty, like Hnath’s play. 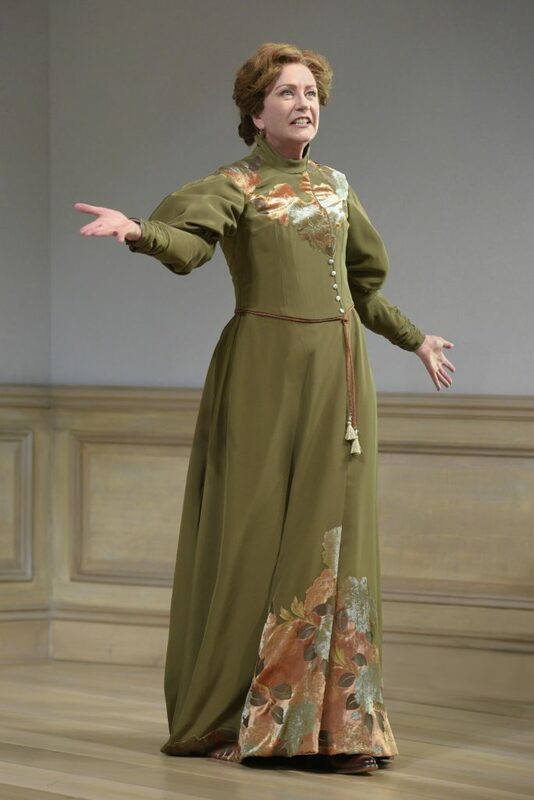 We are shocked and amused by confrontation and manipulation of the older housekeeper Anne-Marie (terrific Nancy E. Carroll) who, Nora left to raise three kids. Anne-Marie insists on Nora’s selfishness, self-centered choices. Anne-Marie makes us understand the price she, too, has paid for Nora’s exit. They are funny as they feud, setting a grotesque tone for Hnath’s brilliantly written new classic. Hnath employs a dark comedy while debating serious issues—an echo chamber of arguments, out of date ideas, and startling issues—that leaves us gasping with wonder and laughter. Hnath succeeds in gripping us with a mystery and embedding it in brave personalities that leave us in wonder. Nora above all, the modern woman, ahead of her time (spectacular Mary Beth Fisher) can make the roof fly off that house. Fisher’s Nora is commanding, honest, and incisive—we can feel her thinking and feeling in front of us, compelling us to follow her struggle and her life as she recounts what she’s been through in the last fifteen years. Fisher makes Nora both intriguing and fearful—a wondrous combination of traits. When Torvald bustles into the surgical room, all full of business and hurry, we brace for a clash—but it’s not what we expect. Once again, Hnath pulls rabbits out of hats. Judd turns Torvald into a clown, an injured man, and a surprising human being. Hnath probes the depths of a formerly stock villain to bring forth comic revelations about his life post-Nora. Judd makes magic from Torvald turns of mind, and grips us with his wild eyes and a signature smirk. Judd and Fisher make a monstrous modern pairing that soars to new heights with Hnath’s version of fifteen years after the apocalypse. Finally, the frosting on this rich and rewarding cake is Emmy (elegant Nikki Massoud), who takes another perspective and surprises us again. 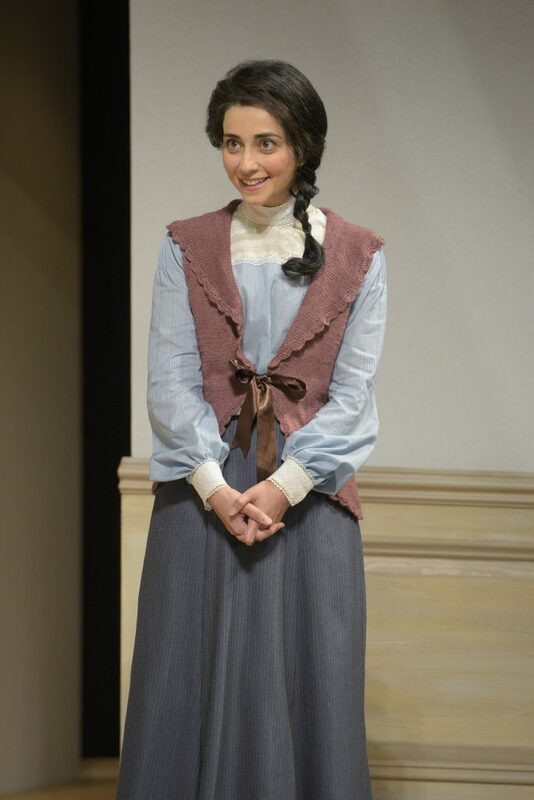 Emmy (ME) upsets the expectations of Nora, Helmer, and Anne-Marie, with her logical expectations of modern life. She wants what her mother has rejected—which must be her right and her legacy. Superb performances by all four actors—who engage us with detailed speeches aimed directly at the audience. Four chapters, four assertive characters. Fascinating direction and interaction, all the time. The answers are all in the Hnath’s smart and sly writing, in the captivating performances by these great actors. 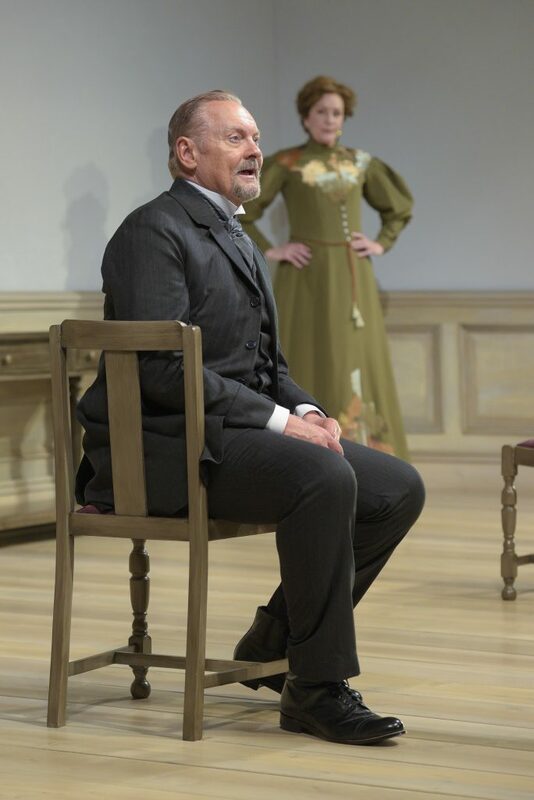 “Part Two” brings back Ibsen’s glory, and raises the stakes for our time. Cast: Nancy E. Carroll, Mary Beth Fisher, John Judd, and Nikki Massoud. “Dȇmos Krátos Theátro” Inspires Laughs & Voting, at PianoFight, S.F.